Well, what a week it has been. You'll know what I mean. It hardly bears thinking about, but it won't go away and my fears for the future multiply daily. 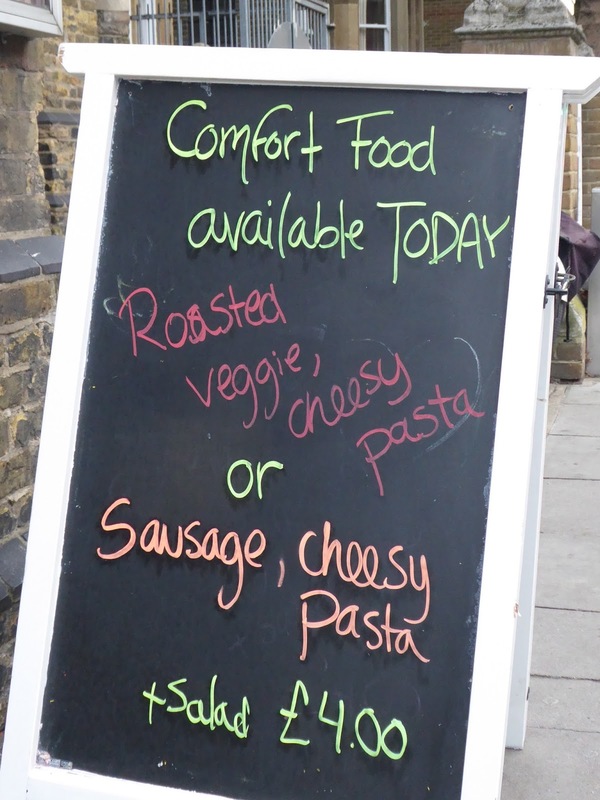 So, like the good people who put this board up outside a local church cafe, a little comfort seems needed all round and food seems as good a starting point as any, though possibly definitely not cheesy pasta. No, no, no. Soup is definitely nearer the top of my list. We've probably eaten at least three different types, homemade, in the last week alone; carrot and coriander, my latest herb of choice; celeriac, leek and potato; and a very tasty spicy Mexican tomato soup that came in a Hello Fresh vegetarian box on sale at Liverpool Street station for a donation to the Felix Project. Next up would have to be toast, with or without embellishment of any kind; my persona fixation is marmalade just now. Toast had been on my mind since I spent a couple of hours indulging in comfort-blanket that it the Edward Ardizone exhibition at the House of Illustration a couple of weeks ago. Fans will know that he created the feisty Diana who boldly rescued a poorly rhinoceros by plying him with a great deal of toast while he settled down in front of a fire in the front room, an inspired piece of nursing if ever there was one. It should be on prescription for the downhearted. And if toast doesn't do the trick, you could always try a cream tea, preferably homemade. Sitting alone in the cafe at the V&A after a Brief History of Underwear I counted my uncorseted blessings and imitated a heroine from a Barbara Pym novel, though the portion may not have been quite so ladylike. I know it doesn't seem like sensible, or even healthy, cold weather food, but at least it's a reminder of sunny days. And if that doesn't do the trick, a square of 85% chocolate might help. Or a trip to Smitten Kitchen, a brilliant post which ends with a very sensible next step. Anybodyseeking a bit of comfort? Oh yes! Comfort food is one very good answer to how many of us are feeling these days, and you've got some great suggestions here. Currently visiting Italy (just outside Rome) and finding one or two culinary consolations! Yep, rather a lot of comfort eating going on here, too. Soup, toast, porridge, jacket spuds, curry, crumble, dumplings, cake. Pretty much anything and everything. Porridge! Of course. We eat it every day. How could Inforget it?